Skiing at Mt Bachelor in Oregon is outstanding for families. It’s a big mountain, with 3,700 acres, from tame sunny beginner terrain to untamed summit snowfields off the 360-degree peak. Bachelor is beautiful too, but there is no slopeside lodging at Bachelor. The ski area is located in the Deschutes National Forest so you won’t find the convenience of on mountain lodging. Instead you find unspoiled natural scenery and uncluttered base areas at West Village and Sunrise. For lodging while skiing Bachelor, you can stay in the fun friendly town of Bend 20 miles east or Sunriver 20 miles to the south east. Sunriver is an extensive planned resort and residential community developed in the 70’s, formerly an army training camp. The setting of Sunriver’s 3,300 acres in the Cascade Mountains is serene, and a river runs through it – the Deschutes River winds its way to the north west. For lodging here during your ski vacation at Bachelor, you can stay at the River Lodge or rent one of over 4,000 homes in this closely knit contrived community. Everything is connected by Sunriver’s labyrinth of peaceful roads through ponderosa pine groves, with lots of traffic rotaries ( 11 rotaries according to my count as we went round and round). Families can rent a two to five bedroom Sunriver home for their ski week at Bachelor, enjoying the amenities of a house, kitchen, living areas, deck, many have outdoor hot tubs, and garages. The Sunriver property management cares for the homes and provides rental guests with passes to the SHARC water park. Sharc stands for Sunriver Homeowner Aquatic and Recreation Center – not for ferocious fins in the water. Sharc offers tons of wet and wild family fun from indoor and outdoor pools, to planned activities, sports courts, and fitness facilities. Sharc even has a year round outdoor tubing park. Sunriver is sprawling with miles of well-paved walking and bike paths leading to SHARC, three golf courses, a marina and a spa. There is even a town center, Sunriver Village, where you find a Country Store selling staples for your home away from home, restaurants, shops and bike rentals. The grand Sunriver Lodge serves as a beautiful gathering place apres ski at Twisted River Tavern, Carson’s and The Living Room of for dinner overlooking the Meadows golf courses and river in the distance. Sunriver has all shapes, sizes and vintages of homes (since the development started in 1968 – some are new, others renovated, some are dated). Ours was a lovely multilevel ranch overlooking the Deschutes River and the bike path through huge windows, with a welcoming gas fireplace and our own private outdoor hot tub under the oversized cedar deck. 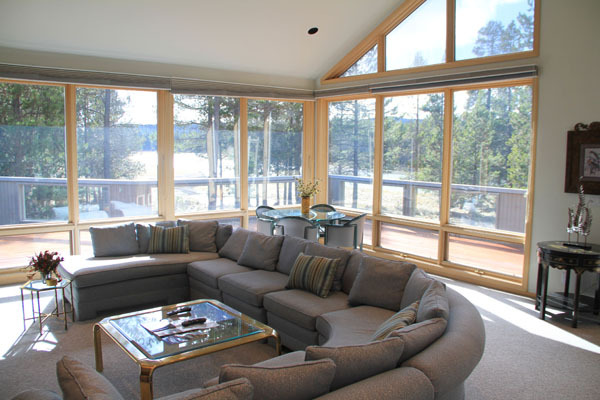 Sunriver offers very spacious digs for families looking for a home away from home on their Bachelor ski vacation. Or stay in downtown Bend – this fun friendly dog-loving town of 80,000 i renowned for its brewpubs, coffee shops and cool vibe. The Oxford Hotel in the heart of Bend has posh suites and hotel rooms, just a short walk to Bend brewpubs, shops and great restaurants like Zydeco and family-friendly Deschutes Brew Pub. The drive back and forth Bend to Bachelor is a beautiful, straightforward two lane road. Along the easy drive are a few more lodging options, Seventh Mountain Resort – a Wyndham resort, Tetherow Golf Resort, and Mt Bachelor Village. Besides skiing Mt Bachelor’s 88 trails and tremendous summit snowfields and bowls, there is plenty to do during your visit to Central Oregon. You can go snowmobiling in the Deschutes National Forest on over 280 miles of groomed trails or free riding with Central Oregon Adventures. Dog sledding is offered at Mt Bachelor’s base, as is cross country skiing and backcountry skiing to huts. For less adrenaline activities, tour one of the many local breweries in Bend or visit the High Desert Museum to learn more about this unique climate and its inherent wildlife, and the seismic activity of the many volcanoes around the Cascade Mountains.